On Tuesday, Hayley Stewart, a plus-size style influencer who runs the popular U.K. blog Curves and Curls, posted a tweet chastising celebrities who pretend “anything about the toxic diet culture they’re promoting is #bodypositive,” arguing that “it’s the exact opposite!” Her frustration was directed at Georgia Louise Harrison from the horny English reality TV show Love Island, who, two weeks prior, posted an Instagram ad for an appetite suppressant, V24 Weight Loss Gummies. 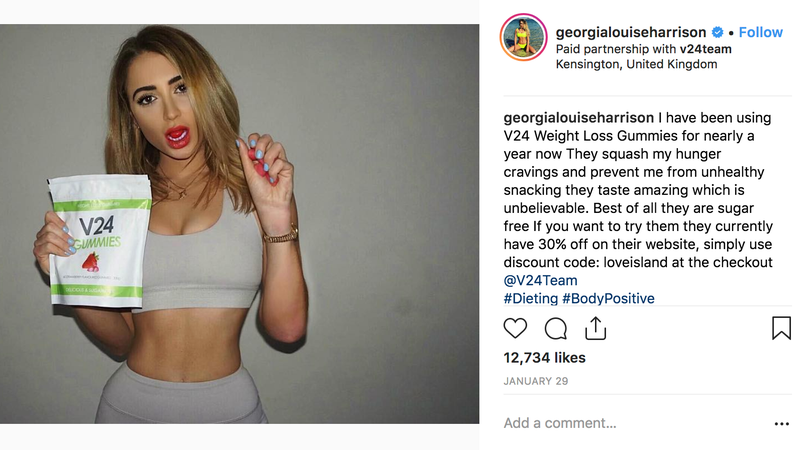 Harrison’s caption celebrated the dieting aid’s ability to “squash” her “hunger cravings” and “prevent” her “from unhealthy snacking” and ended the post with a series of hashtags, including #BodyPositive. In pop culture, body positivity has become a catch-all term that recognizes the value placed on physical appearance and Eurocentric conventions of beauty—the effect those conventions have on both self-worth and self-esteem—and counters by celebrating bodies that do not fit the stereotypical mold. As such, the body positivity movement rallies against diet culture (which equates thinness with health and equates weight loss with positive self-image), and fat-shaming, the derisive behavior or expressions of social stigma towards fat people. Over the past several years, body positivity has morphed into something that looks more like straight-sized people feeling positive about their bodies, which already adhere to standard conventions of beauty, instead of those for whom the body positivity movement was built for and by. Harrison’s Instagram post typifies this dilution. Not simply because she’s a conventionally attractive, slender white woman, the kind of body society values—but because she’s using “body positive” as an opportunity to participate in and sell diet culture—one of the very things body acceptance was created to dismantle. I asked a representative of V24 Weight Loss Gummies’s parent company Protein Revolution Limited if the brand considers its product to be “body positive.” The responded: “We feel that body positivity is all about being confident in your body. There is no better way to improve body confidence than by improving your health and figure.” The company also confirmed that they “directed” the ad, indicating that the use of the #BodyPositive hashtag was their decision. “Although Georgia Harrison was a paid influencer she has been using the product for a year now and loves it,” the company added. Harrison and V24 aren’t the first to use the body positivity movement to promote products and make money off of insecurity. On Instagram, the #BodyPositive hashtag has been used to market catering in Poland, bras, fitness programs and beyond, but using the language of inclusion and acceptance to sell what are essentially diet pills is a farce. Capitalism has long found ways to market progressive systems for its own benefit, so the fact that diet products are sold in the name of body positivity isn’t ever a surprise. But it is unhealthy, and it goes against the very fabric of the movement, diluting its progressively feminist intentions. This is body positivity’s end game, and it will continue to shape shift into meaningless consumerism. What Do I Want From a Fat Protagonist?